The Greeneville, Tenn.-based company, which specializes in handling air cargo, reported net income of $27.7 million, or 95 cents a share, in the three months ended Dec. 31, compared with net income of $34.7 million, or $1.16 a share, in the same period a year ago. Results in 2017 included a one-time benefit related to the Tax Cuts and Jobs Act. Income from operations was $35 million in the fourth quarter of 2018 versus $27.8 million in 2017. Revenue increased 9.7% to $356.6 million in the fourth quarter of 2018 from $325.1 million in 2017. "Our fourth-quarter earnings per share of 95 cents exceeded our guidance of between 81 cents and 85 cents,” said Michael Morris, senior vice president and chief financial officer. The results were driven, he said, by strong intermodal results, improved safety performance and a lower tax rate. CEO Tom Schmitt said the strong fourth quarter fueled positive results for the year. The company posted net income of $92.1 million, or $3.12 a share, in 2018 compared with net income of $87.3 million, or $2.89 a share, in 2017. Revenue jumped 13% to $1.32 billion from $1.17 billion. 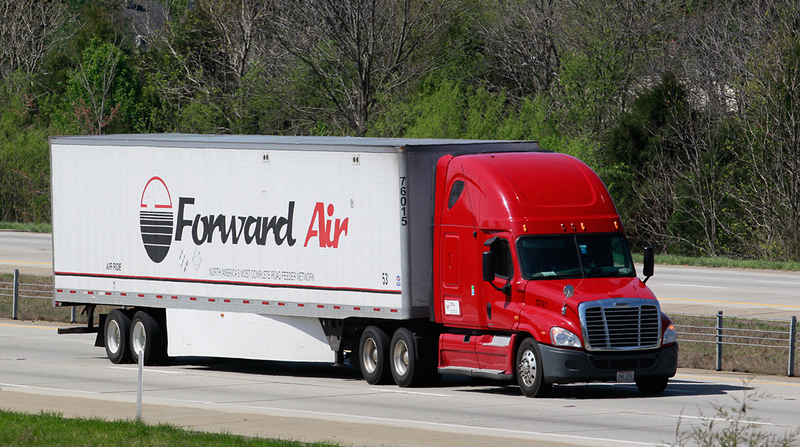 Breaking down results by division, expedited LTL generated operating income of $25.4 million in the fourth quarter of 2018, an increase of 2.6% from $22.8 million in 2017. Revenue rose 8.3% to $196.2 million from $181.2 million. Truckload premium services generated operating income of $1.7 million in the fourth quarter of 2018 compared with a loss of $500,000 in 2017. Revenue fell 6.1% to $49.6 million from $52.8 million. Intermodal generated operating income of $6.9 million in the fourth quarter of 2018, more than double the $3.4 million in 2017. Revenue climbed 18.7% to $52.7 million from $44.4 million. Pool distribution generated operating income of $2.2 million in the fourth quarter of 2018, a drop of 18.5% from $2.7 million in 2017. Revenue increased 17.8% to $60.9 million from $51.7 million. Forward Air ranks No. 33 on the Transport Topics Top 100 list of largest for-hire carriers in North America and No. 2 on the TT list of top for-hire carriers in the Air/Expedited sector.